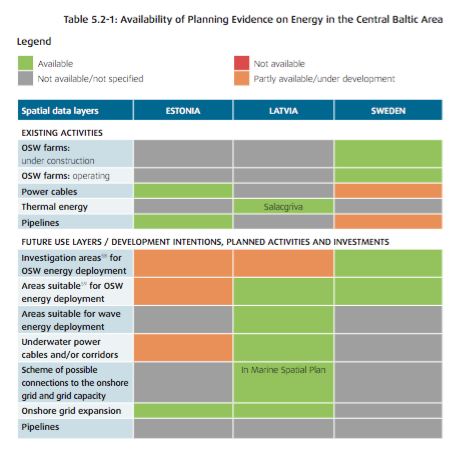 An inventory and analysis of available information on sector interests and needs was conducted per country (Estonia, Latvia, Sweden) for the Central Baltic case study in the Baltic SCOPE project. This included 1) what types of data are relevant and needed to address sector and cross-sector issues; 2) availability of the sector specific data for each country involved; and 3) reflections on research needed to improve the knowledge base and priorities. How can existing planning evidence be assembled and evaluated for a cross border MSP process? How can data gaps and needs be identified? This exercise was conducted in the context of the Central Baltic case study for the BalticSCOPE project. Relevant sectors included energy, environment, shipping, and fisheries for the threeo countries involved: Estonia, Latvia and Sweden. 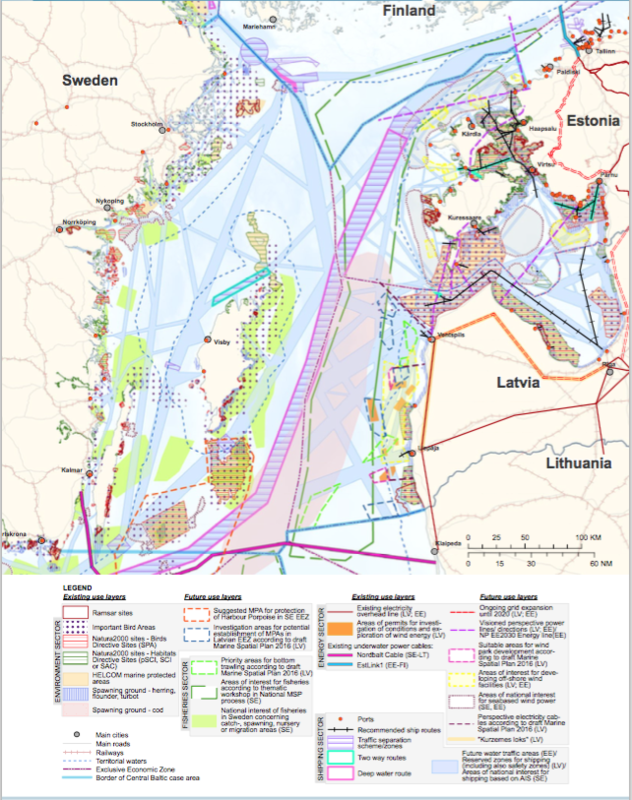 For each sector, compile a map, overview table of currently available data, and a review of data needs and availability for the overall Central Baltic area according to individual countries. Each sector and topic group assembled existing national data sets. Then a discussion took place regarding national approaches and methodologies in order to map national interests and define possible future directions and tasks for development of a shared view of the Central Baltic area. Analysis to develop the maps, tables, and review of data needs were conducted by topic experts and spatial planners in group meetings and discussions. Maps were then designed by GIS experts. The mapping exercise allowed planners to recognize data gaps and needs and important issues among the sectors. Discussions around the maps created an understanding that the countries involved need to find agreement on how to resolve data and evidence issues. 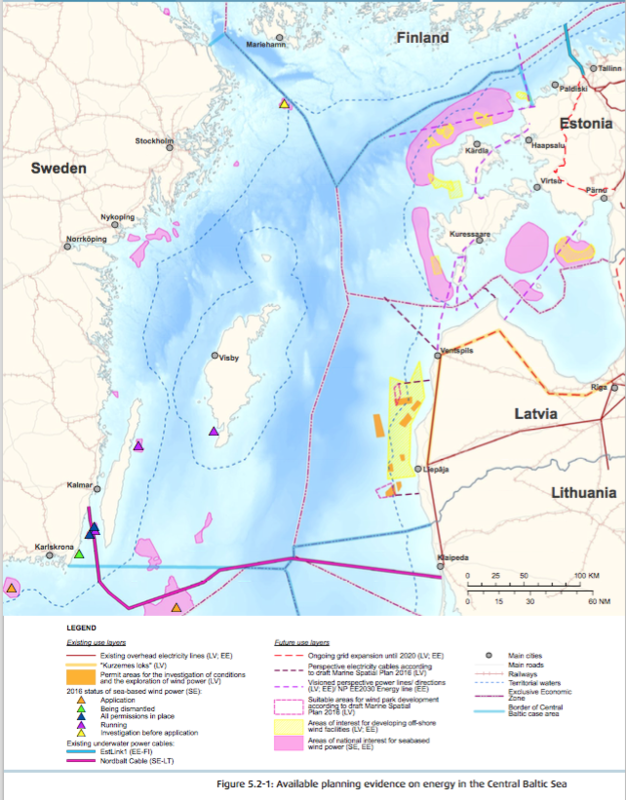 The mapping exercise also resulted in the first cross sector map for the Central Baltic, showing the complexity of current and possible future uses. It is a first attempt to put together all existing information spatially, and serves as a tool for further discussion. Further information can be found in Chapter 5 of the linked report. A similar exercise to assemble and evaluate existing planning evidence could be conducted in another cross border MSP process. Funding Source: the report was developed within the BalticSCOPE project, funded by EMFF. Costs: not possible to be defined, as part of the overall funds to BalticSCOPE project.